Performance by Tiffany Lin of new and contemporary works for pianos. 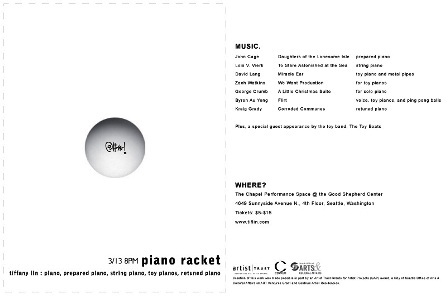 Program features two world premiers of pieces especially commissioned for this event; Flirt a set of five modular and portable interludes for toy pianos and ping pong balls by Seattle composer Byron Au Yong and Corroded Communes, a piece for retuned piano by Australia based composer Kraig Grady. (Seattle WA) Pianist and toy pianist Tiffany Lin announces Piano Racket, a concert featuring solo music for prepared piano, string piano, retuned piano and toy pianos. The program features a double world premiere of music written for this event by composers Byron Au Yong and Kraig Grady. Flirt, Au Yong's portable interludes for toy pianos and ping pong balls finds love in the little things of life with lip smacks, whistles, pops, swoops, yelps, and woofs. Grady's Corroded Communes explores the retuned piano based on a specific tuning developed by musician George Secor. It is noted by Grady as, "unlike other tunings he has used… it is in this case something quite conventional that he almost feels more than hears." This is Grady's first piece written for the piano in 35 years of composing. Piano player and wannabe toy piano collector Tiffany Lin spent her younger years in Lodi, CA. Also known as tiflin, Miss Lin was schooled at the California Institute of the Arts by pianist Peter Miyamoto, violinist Leroy Jenkins and influenced by Wadada Leo Smith. Lin earned her Bachelors at the Cornish School in Seattle, WA where she studied with Laura Kaminsky and Oksana Ezhokina. Currently, a resident of Seattle, WA she boasts awards such as a fellowship from the Virginia Center for the Creative Arts, acceptance to the Institute and Festival of Contemporary Performance in NY, an Artist Trust GAP grant and a 4Culture Site Specific grant. Current projects include a recording project with percussionist/instrument maker Paul Kikuchi, a collaboration with composer Zachary Watkins involving surround sound piano and trying to spend less time on the computer. Byron Au Yong composes songs of dislocation for Asian, European, and handmade instruments. His works have been featured in concert halls, museums, and site-specific locations that include the Hochschule für Musik und Theater Hamburg, Tokyo Art Museum, and Seattle Aquarium. Au Yong is a recipient of numerous honors that include a Ford Foundation Fellowship, Creative Capital Award, and Meet the Composer Grant. He teaches in the dance department at Cornish College of the Arts and is the artistic director of Piao Zhu: Flying Bamboo. Kraig Grady born in Montebello, CA. While still in his teens, he realized he had an overwhelming urge to be a composer. After studies with Nickolas Slonimsky, Dean Drumond, Dorrance Stalvey (all briefly) and Byong-Kon Kim (longer) he produced his earliest compositions. Since meeting Erv Wilson in 1975, he has composed and performed in alternative tunings of Wilson's. In the 80's Kraig Grady (along with Keith Barefoot) became one of the first to revive the combination of live music with silent film. Grady has presented his work at the Norton Simon Museum of Art and the UCLA Armand Hammer Museum among other places. He has been nominated 4 times for the L. A. WEEKLY Music Award best uncategorizable artist and was chosen by BUZZ Magazine as one of the 100 coolest persons in Los Angeles.